Union Institute & University’s (UI&U) Maternal Child Health in Human Lactation is one of the few lactation programs in the country offered at both the bachelor’s and master’s level. To complement the innovative degree program, UI&U and OhioHealth Mothers’ Milk Bank (OHMMB) have partnered to open the second milk drop in Cincinnati. Human milk is the ultimate source of nutrients and immune protection for infants. Babies benefit from the active growth hormones, developmental enzymes, infection fighting and immunological factors found in human milk. 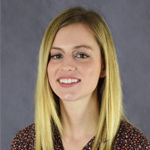 Chris Smith, UI&U alumna (2005), OHMMB Outreach Coordinator & Lactation Consultant, and president of the Ohio Lactation Consultant Association (OLCA) was instrumental in bringing the milk drop to Union. “As a graduate of UI&U I am excited to see my school reach out and support breastfeeding mothers in the Cincinnati area by opening this milk drop. 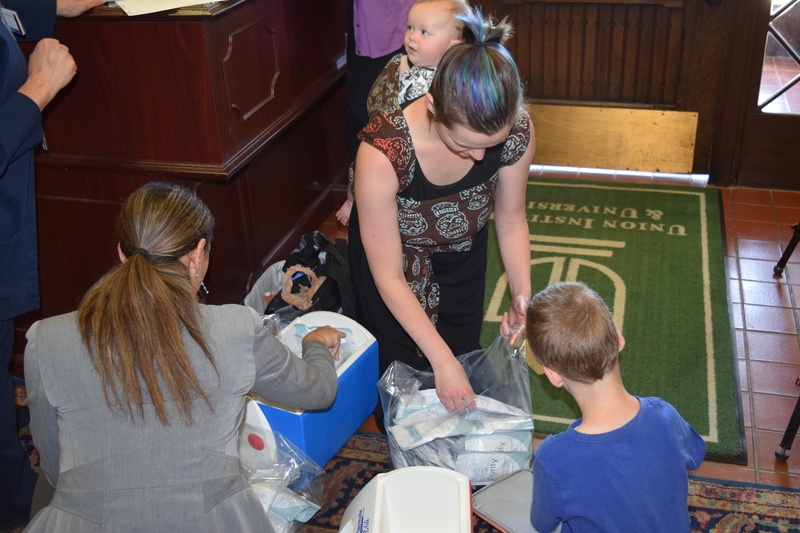 I feel like this is their way of giving back to the local community as well as supporting the lactation community by supporting milk donation and milk banking,” said Smith. The donated milk benefits babies in the Cincinnati region. “Currently, about 23% of donors to the OhioHealth Mothers’ Milk Bank are from the Cincinnati and Northern Kentucky Area. In the past year, roughly 20,000 ounces of milk has been donated to hospitals in the area. Just one ounce of milk can feed a premature infant for three days. In 2017, OHMMB dispensed about 30,000 ounces (10%) of our milk to four hospitals in the Cincinnati/NKY area,” Smith explained. A milk drop allows the donor to drop off the milk at Union in one easy stop. Union personnel will immediately put the milk in a freezer and prepare for mailing to the OhioHealth Mother’s Milk Bank. 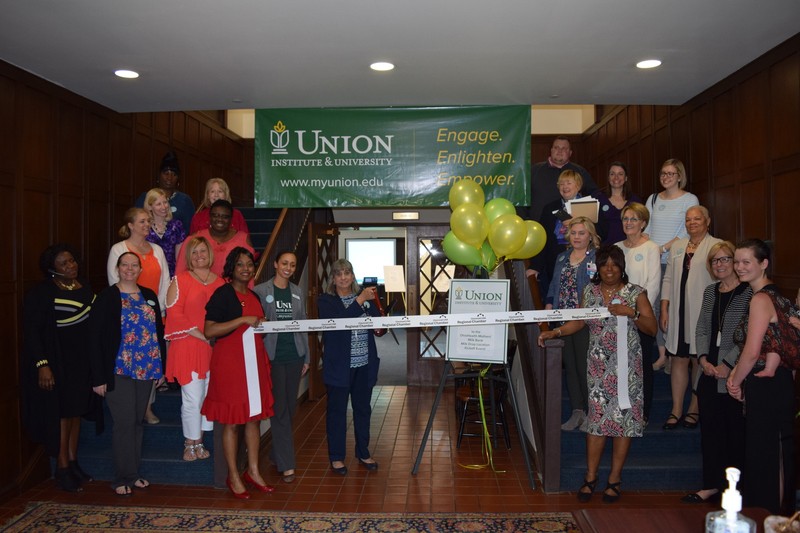 The Union team who worked to make this partnership a reality include Nicole Schreck, Senior Director of Enrollment and Lakesha Williams, Regional Recruiter. Team members who will oversee the process are Renee Cave, receptionist and Chris Clark, maintenance. Click here to watch a video of the opening. To learn more about being a donor, visit https://www.ohiohealth.com/locations/womens-health/mothers-milk-bank/. If you have a passion to counsel expectant mothers and mothers of infants about feeding and caring for their young infants, click below to start your new career today. Today, April 25, is Administrative Professionals Day and we are shining the spotlight on Renee Cave. Renee is the face and voice of the Cincinnati Academic Center in her role as receptionist and multi-tasker. She provides exceptional customer service and always puts the customer first. In addition, Renee is knowledgeable and passionate about Union and always has a smile and warm greeting for everyone she meets. Learn more about Renee, who has been with Union since 2011, in the Q&A below. A. Seeing adults overcome the challenges of balancing work, family and education. A. I want to be a part of an organization where good customer service is important and appreciated. A. One that involves traveling the world! I’ve been a travel consultant, airline employee and a published travel writer. A. How I balance tending to work, a teenager, my 90-year-old mother, four grandchildren, with another on the way! I’ve also held the same volunteer position at my church for over 14 years. A. I enjoy interpreting the Bible for guidance and wisdom in all areas of life. What Does Your Personality Say About You? Find out by using the Enneagram assessment tool, an online course offered through the Union Institute & University’s Continuing Education program in partnership with Enneagram.com. Taught by renowned authors and psychologists Helen Palmer and Marlene Cresci-Cohen, the tool is described this way. “With a history of centuries, the Enneagram is arguably the oldest human development system on the planet. During the past decade, the system has undergone a renewal of scholarly attention within the context of current personality typologies. The result is a reliable integration of psychological insight about human differences, set alongside a non-sectarian body of spiritual practice that relaxes inner resistance while encouraging inner receptivity. In the Q&A below, Kath Gilliam, Managing Partner of Helen Palmer, Inc. www.enneagram.com, provides in-depth answers on how the Enneagram improves relationships. Q. Why do you recommend this course? A. The reason I recommend this e-course is that the Enneagram, more than any other personality typology system, goes beyond surface categorizations of behavior all the way into our individual “inner dynamics.” So what is meant by “inner dynamics”? Simply defined, it means how we are to ourselves, including our habitual focus of attention, our emotional and psychological reactivity patterns of thinking, feeling, and behaving, especially under stress, and the view screen by which we experience our particular sector of the world. Put more succinctly, the nine types that comprise the Enneagram system allow ourselves to be understood by others as we are to ourselves, not as they think we are, but as we actually are to ourselves. Correctly identifying our typology, and then learning the content of that typology informs our relationships with ourselves and others in the most profound and life transforming ways. Helen Palmer, as the world’s leading expert on the Enneagram provides all such knowledge in the most user-friendly e-course. Team-taught with Marlene Creci-Cohen, PhD., students will not only discover their individual type, but will be properly oriented/educated as to the most effective and compassionate use of this unique information for the benefit of all they interact with, including a much healthier self-regard. Family and work relationships will improve as a result. Q. What is the goal of the e–course? A. The goal of the Enneagram course is to accurately and compassionately present the nine-pointed Enneagram system to students keen on improving their interpersonal skills and self-knowledge both in love and work. Q. What do you want people to know about this course that they may not know? A. More than theory, the Enneagram course offers the student immediate access to and application of the information offered. It does so by allowing the student to recognize their type in ways that are verified by their lived experience. Perhaps most important, the student will learn that improvement of any relationship is an “inside job. In other words, the way to improve any relationship is by working on yourself and not the “other”. The Enneagram, more than any other typology, equips the person to do just that by offering customized skills and insights to guide self-development. In short, this course could be a life-changing experience for anyone interested in living a fuller, more meaningful life, including improved relationships. Union Institute & University is co-sponsor of this training in partnership with Enneagram.com.  Stay abreast in your field with the Union Institute & University Continuing Education courses designed to continue your learning experience without the investment of earning a degree. Click below. Founder’s Day is a time to share the Union mission that engagement, enlightenment, and empowerment transforms lives and communities. 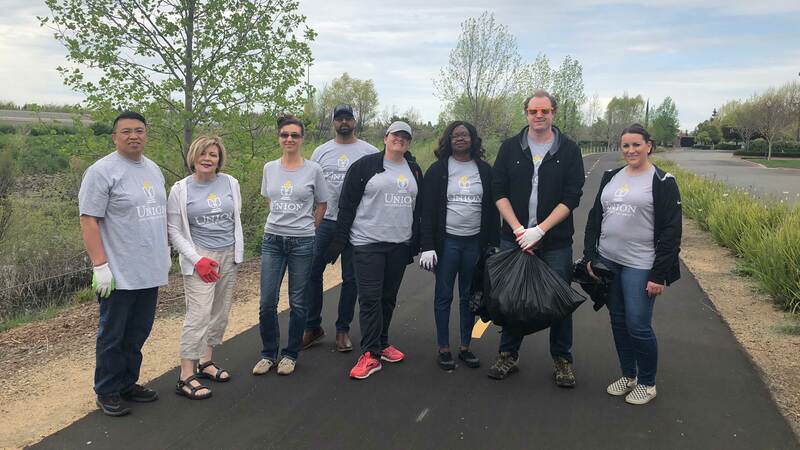 UI&U employees shared that message by volunteering in their communities on April 5. 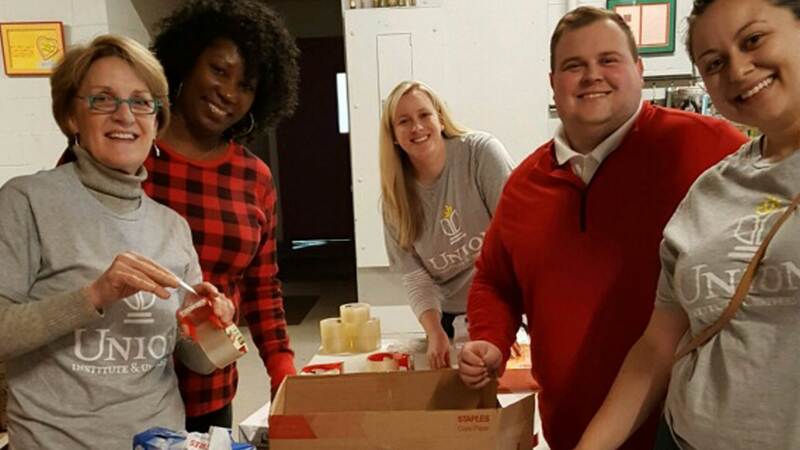 Staff demonstrated that Union’s mission is alive and well, 54 years after its founding. Happy Founder’s Day! 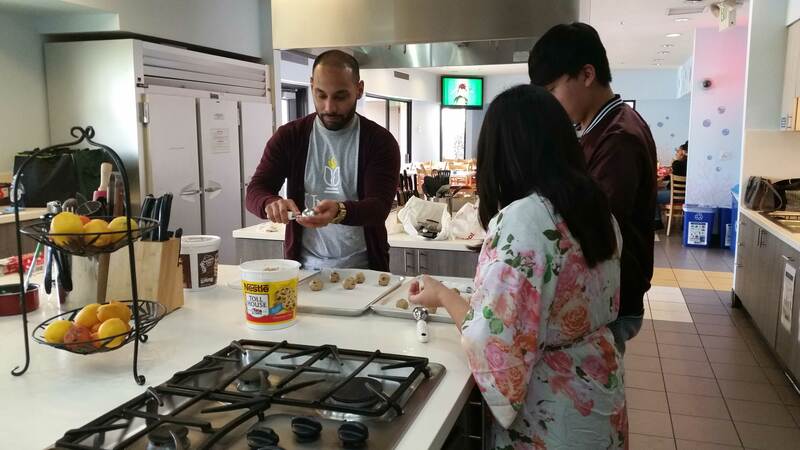 Baked with love – The Los Angeles Academic Center staff volunteered at the Ronald McDonald House. 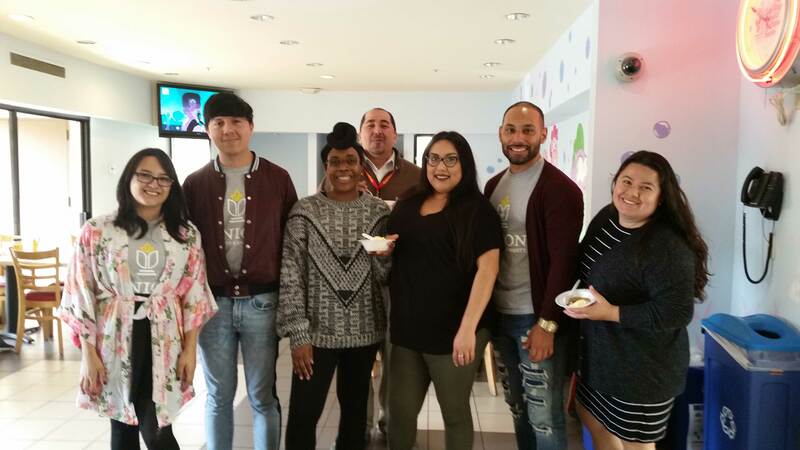 Staff members baked with the children and brought cheer to the families who call the house home while their critically ill children and siblings are in area hospitals. That is a great way to transform a community. 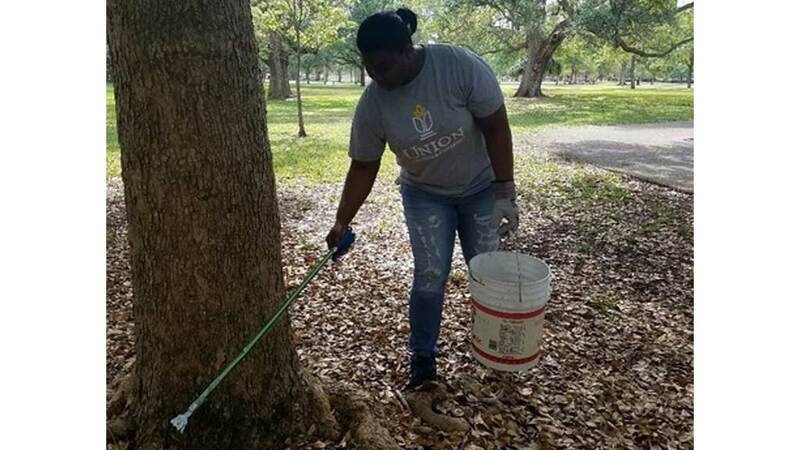 Park beautification – The Florida Academic Center employees were hard at work keeping Topeekeegee Yugnee (TY) Park beautiful and inviting by picking up trash and sprucing up the recreational areas. This effort will help to transform the 138.6-acre urban park just in time for Earth Week. 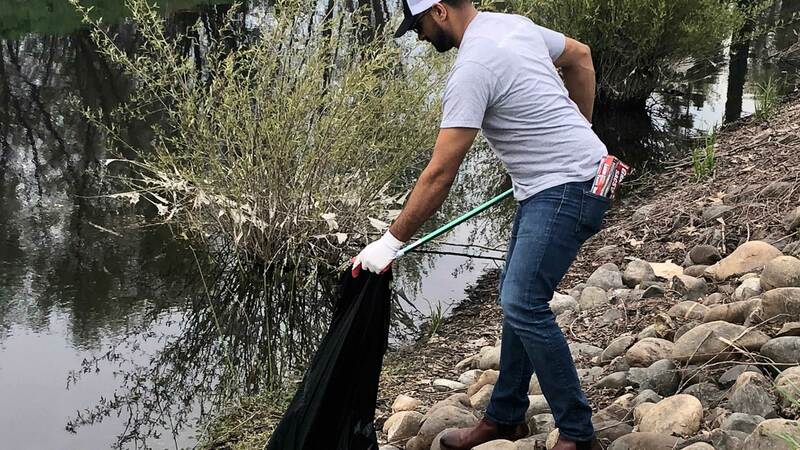 Clean the path – The Sacramento Academic Center took on the dirty job of cleaning paths. What a great way to transform the landscape and increase enjoyment for all, especially joggers and walkers. 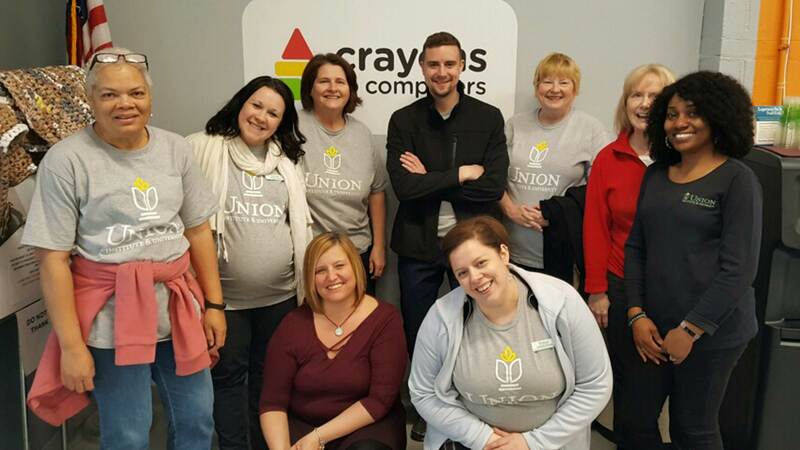 Bridge the gap between students in need and education – The Cincinnati Academic Staff transformed their community by sorting donations at Crayons to Computers. The nonprofit provides a Teacher Free Store and Mobile Outreach Program for teachers and students to receive free materials such as books, crayons, paper, scissors, and pencils, as well as enrichment and incentive items that teachers can use to motivate and inspire student engagement. We are proud to be Union employees and share the mission to transform lives and communities. Today is the day to be part of the Union legacy and choose your career path. Welcome to National Library week, April 8-14, 2018 at UI&U! This year’s theme from the American Library Association is “Libraries Lead.” We’ve put our own twist on the theme with “Libraries Lead” To A Union Degree. “Libraries Lead” To A Union Degree is the perfect time to highlight the many authors in the Union community. If you have published a book and your name isn’t listed below, be sure and complete the “Share Your Story With Union” form to catch us up to date. Elizabeth Aiossa, Ph.D. 2015: Author of The Subversive Zombie: Social Protest and Gender in Undead Cinema and Television, is now available from McFarland & Company and Amazon. 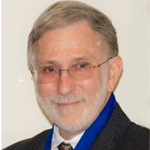 David B. Axelrod, Ph.D. 1997: In the forty years since completing his Union Ph.D. he has had twenty-three books published. His latest is All Vows: New & Selected Poems a collection of poems from his creative writing projects at Union and his first book published in 1968. Dr. Axelrod is the recipient of numerous poetry prizes, and three separate Fulbright Awards. He was the first official Poet-in-Residence in the People’s Republic of China, Poet Laureate of Suffolk County, New York and is currently Poet Laureate of Volusia County, Florida. Barrymore A. Bogues, B.A. 1989: Florida Center: Chair of the Africana Studies Department at Brown University, Bogues earned a Ph.D. at the University of the West Indies, where he taught courses in radical political theory. Black Heretics, Black Prophets: Radical Political Intellectuals (Routledge, 2003) examines the political thought of influential black thinkers in the radical tradition. Figures include the slave Cugoano, Ida B. Wells-Barnett, C.L.R. James, and W.E.B. DuBois. Rita Mae Brown, Ph.D. 1976: Best-selling author of Rubyfruit Jungle; Alma Mater; Six of One; Southern Discomfort; Outfoxed; Loose Lips; and the Sneaky Pie Brown series. Rosemary Ellsworth Brown, Ph.D. 1993: Dr. Brown is a psychologist and author of Addiction is the Symptom Heal the Cause and Prevent Relapse with 12 Steps That Really Work. Joseph Bruchac, Ph.D. 1975: Considered a seminal presence in Native American literature. Award winning storyteller, founder of Greenfield Press publisher for authors from under published ethnic groups; entire family works to preserve the Abenaki culture and traditional skills, language and linguistics, also performing traditional and contemporary Abenaki music. Gary J. Buehler, Ph.D. 1989: Author of An American Story. Available through Amazon. 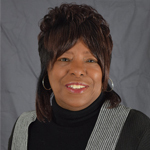 Terriel Byrd, Ph.D. 1999: Author of By This Shall We Be Known: Interpreting the Voice, Vision and Message of Martin Luther King Jr. Dr. Byrd immerses the reader in Dr. King’s work and interprets his message to relevant problems facing society today. Annemarie Colbin, Ph.D. 2002: Founder of the Natural Gourmet Cookery School in New York City in 1977, author of four books, including The Natural Gourmet (Ballantine Books, 1989, 1991), first runner-up prize in the IACP/Seagram national cookbook awards in 1989; Food and Healing (Ballantine Books, 1986), translated into Spanish, Italian, Polish, and Chinese and reissued in a 10th Anniversary edition in 1996; and Food and Our Bones: How to Prevent Osteoporosis Naturally (Dutton, 1998). Robert K. Cooper, Ph.D. 1990: Sought-after motivational speaker and author of Executive EQ and coauthor with Leslie L. Cooper, Low-Fat Living: Skillpower Not Willpower (Rodale Press, 1996), “highly recommended” by Dean Ornish, M.D. Louise Diamond, Ph.D. 1990: The Courage for Peace: Daring to Create Harmony in Ourselves and the World (Conari Press, 2000), co-founder and president emeritus of the Institute for Multi-Track Diplomacy; her new organization, Peace-Tech, will provide tools that empower people to work for a culture of peace in their lives and in the world. Ken Dychtwald, Ph.D. 1976: Interviewed by Morley Safer on 60 Minutes January 12, 2003. Bestselling author of the books, Age Wave, Bodymind, and Age Power: How the 21st Century Will Be Ruled by the New Old, Dychtwald is the founding president of Age Wave, LLC, a firm created to guide Fortune 500 companies and government groups in product/service development for baby boomers and mature adults. Clarissa Pinkola Estes, Ph.D. 1981: Best-selling author of Women Who Run With the Wolves; and The Faithful Gardner; social activist, Jungian psychologist, cantadora (storyteller) in the Latin tradition, post-traumas specialist, and educator-in-residence at Columbine High School in Littleton, Colorado. Tom Fleischner, Ph.D. 1980: Edited a new anthology– Nature, Love, Medicine: Essays On Wildness and Wellness. He is Executive Director, Natural History Institute. 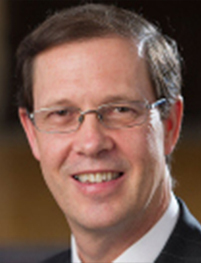 Keith Grant, Ph.D.1995: Four articles published in Journal of Business and Technology. The titles are described below: Management Tools and The Business Systems published in November 2017 and Models and Theories for Understanding Change and The Elusive Paragon published in March 2017. Colin Greer, Ph.D. 1973: President, New World Foundation; author, with Herbert Kohl of The Plain Truth of Things (1997) and books on the history of public education, including The Great School Legend. Co-author of Choosing Equality: The Case for Democratic Schooling, winner of the American Library Association’s 1988 Eli M. Oboler Intellectual Freedom Award; regular author for Parade magazine. Sidney Harman, Ph.D. Mind Your Own Business (ISBN: 0385509596 Doubleday & Company, 2003), Executive Chairman of Harman International Industries, Inc., a leading manufacturer of high-quality, high-fidelity audio products and electronic systems for the consumer and professional markets include Harman Kardon, JBL, Infinity, undersecretary of commerce under President Carter Apr 21 1977 to 1979. Tanya Higgins, Ph.D. 1994 and Nancy Diggs, Ph.D. 1994: A Look at Life in Northern Ireland: How Do Women Live in a Culture Driven by Conflict? (The Edwin Mellon Press, 2000), anthropological examination of the enduring efforts of women in Northern Ireland to facilitate peace in the face of daily conflict, evolved from Higgins’ Project Demonstrating Excellence. Benjamin R. Justesen, Ph.D. 2009, wrote Union Institute & University at 50: leaders realizing a dream. He is a former journalist and current editor. His other published book includes George Henry White: An Even Chance in the Race of Life. Michael T. Klare, Ph.D. 1976: Author of Resource Wars: The New Landscape of Global Conflict (Henry Holt and Company, 2001); director of the Five College Program in Peace and World Security Studies. He spends half his time teaching in the program which includes Amherst College, Hampshire College, Mount Holyoke College, Smith College, and the University of Massachusetts at Amherst. He’s also contributed to 12 books on United States defense policy, the arms trade, and world security affairs. Bernie Krause, Ph.D. 1981: Very well known in new music and environmental/natural science fields for his recordings of nature and animals; worked with Jane Goodall and Dian Fossey. Betty Krasne, Ph.D. 1979: Publisher of over 60 articles and six books. Her latest book is Twentieth Century Literary Criticism. Phillip Lopate, Ph.D. 1979: Author (The Art of the Personal Essay, Writing New York: A Literary Anthology), educator (Columbia, NYU, Bennington, Hofstra); film critic and essayists for the New York Times. Clarence Major, Ph.D. 1978: Prize-winning author, essayist, educator (Temple, University of Washington, University of California, Davis) poet, and artist. Author of short story collections and several novels including Dirty Bird Blues and Painted Turtle: Woman with Guitar. Also subject of monograph on his work, Clarence Major and His Art. Karen A. McClintock, Ph.D. 2001: Dr. McClintock is a psychologist, adjunct professor at Southern Oregon University and author of My Father’s Closet, a memoir. She is also the author of Shameless Lives, Grace-Full Congregations, Sexual Shame: An Urgent Call to Healing, and Preventing Sexual Abuse in Congregations. Phillip Obermiller, Ph.D. 1982: Has published numerous books including African American Miners and Migrants: The Eastern Kentucky Social Club published by the University of Illinois Press. Barbara Bridgman Perkins, Ph.D. 1989: Author of Cancer, Radiation Therapy, and the Market (Routledge). The book shows how the market shaped the development and practice of radiation therapy and the radiation oncology specialty. Glenda R. Taylor, Ph.D. 2017: Author of ten books including her latest, Truth Beyond Illusion African American Women 1860s-1950s. She has extensive knowledge of American history as it relates to African-American history and culture. She has been featured in the New York Times and in 2010; she was selected by the New York Daily News as one of America’s Great People. Joyce Tenneson, Ph.D. 1978: World-renowned photographer and author of six books, including Illuminations, Light Warriors, and Flower Portraits (Bullfinch Press). Her Wise Women (Bullfinch Press, 2002) inspired a series on NBC’s “Today Show,” celebrating vital, energetic, and beautiful authors, activists, and actors as well as teachers, Supreme Court justices, and just “everyday mothers and grandmothers.” Tenneson traveled throughout America, seeking, interviewing, and photographing 80 women ages 65 to l00. Lloyd Williams, Ph. D. 2001: Dr. Williams is working on his eighth book, Psychological Invisibility; Exploring the Enmeshment Trap that Binds Us. He is also working with China on a unique PTSD model from a Chinese Lens and with the LGBT communities in America on trauma and stress related processes. 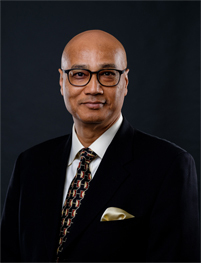 He is Chief Executive Officer, Dr. Lloyd C. Williams, Consultants. Learn where a Union degree can lead you. Click below. Katy Tucker is the Technical Services & Electronic Resources Librarian. She leads students to the library’s vast collection of online resources which include numerous e-books, online journals, and streaming video. 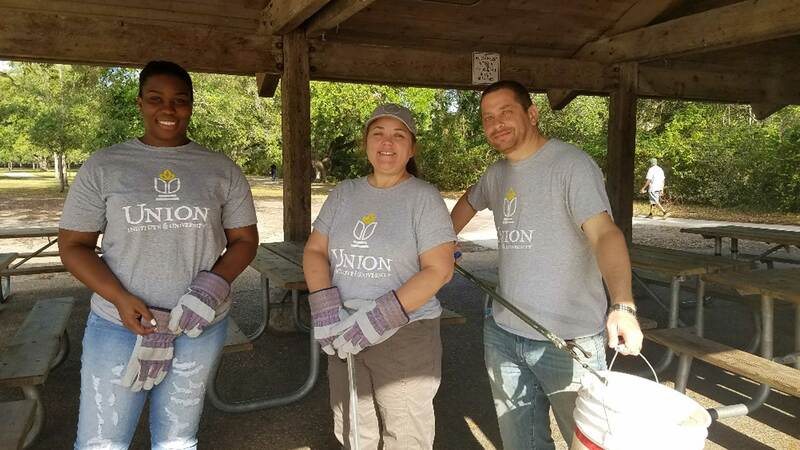 Learn why Katy is glad to be part of the Union family in the Q&A below. A. Higher education has opened the door to many great opportunities for me, so I really value that I am able to assist others in accomplishing their own educational and career goals. It is also exciting to help Union’s students as they contribute to the understanding of new research and expand their knowledge. A. Union offers students the opportunity to achieve their educational goals whether they are just starting out, pursuing continuing education or completing their degree. Because I have always enjoyed studying and consider myself a lifelong learner, Union’s education model really resonated with me. I was also intrigued to learn that Union’s library was completely online. The world is becoming more and more digital, so I was excited to join a school that was successfully embracing the future. A. Although I love being a librarian, I have soft-spot for animals, so I think my dream job would be to work as a zoologist. It would be especially fun to work for the Cincinnati Zoo and help take care of Fiona the hippo. A. I think people are surprised by the fact that I enjoy playing video games in my free-time. I am a big fan of classic games like Super Mario and World of Warcraft. A. I don’t have a favorite book, but I really enjoy mystery-thrillers. I also try to step out of my genre “comfort zone” every once in a while; right now, I am reading a fantasy series by Kendare Blake. Learn where the Union library can lead you. Click below. Meet Samantha Hines, a librarian and Union Ph.D. student. Learn how the UI&U library is leading Samantha to the research needed to complete her major in Ethical & Creative Leadership. Q. How does the library impact your research? A. For me, as a librarian, the library is the foundation of my research. I usually develop research projects based out of situations I encounter at work—how can and should academic libraries support students needing connections with social services, for example, or how can we increase racial diversity among library administrators? Then, of course, I turn to the library’s resources to find out all that I can on the topic before I dig into research design and analyzing my results. Q. How do the librarians help you? A. Librarians help connect me with materials about my topic of research; they find things that I didn’t even know existed! They help me find other experts to talk with about my research. They help me with citation of resources. And of course they share their invaluable perspectives and experiences when I do research on them! A. Persist in helping my profession of librarianship embrace its core principles of community building, open access and freedom of information. A. I met a graduate of the program, Kate Reavey. I had previously resisted getting a doctorate because it felt like credentialism, but her description of the program made me feel like Union would be a real learning experience. A. I was delighted to find an online Ph.D. program with a strong emphasis on social justice, where the school’s objectives blended so well with my own research and career goals. A. Relax, it’s all going to be okay. You’re doing amazing! A. My mother, who showed me the value of hard work. She returned to school for an associate’s degree once my brother and I were in elementary school, and the job that she got and kept for 30 years lifted my family out of poverty. Incidentally, that job was at a library! The UI&U library will help lead you to your educational goals. Visit the library today. Click below.